These 50-minute classes involves a series of classical pilates exercises performed on a mat with each exercise emphasizing breath, core conditioning, and body awareness. Instructors will pay special attention to alignment and form as classes have a maximum of 5 people. Props –including foam rollers, therabands, small weights and magic circles may be used to add challenge or assistance throughout the class. Whether you’re a beginner or expert practitioner, this mat workout will strengthen the core and tone the body. After mastering the basic repertoire in beginner/intermediate mat classes, you can challenge yourself with the quicker-paced intermediate option with permission from your instructor. Group equipment classes are separated by level in order to accommodate all clients –the reformer, tower and chair are pilates apparatus designed to add resistance and support to a classical pilates workout with the use of spring resistance. Each exercise emphasizes breath, core conditioning, and body awareness. This full-body workout will strengthen your deepest abdominal muscles while toning and integrating your limbs. We strongly recommend that all new clients start with a introductory private pilates session. this 50-minute session is a thorough, customized workout that explains the basics of the pilates technique and equipment. One-on-one training is helpful because the instructor can provide their full attention to your specific needs and address any injuries or weaknesses. It is very important to understand the basics and any necessary modifications before entering a group or class setting. After this session, the instructor can help you develop a workout program of private training or group classes to help you reach your fitness goals! 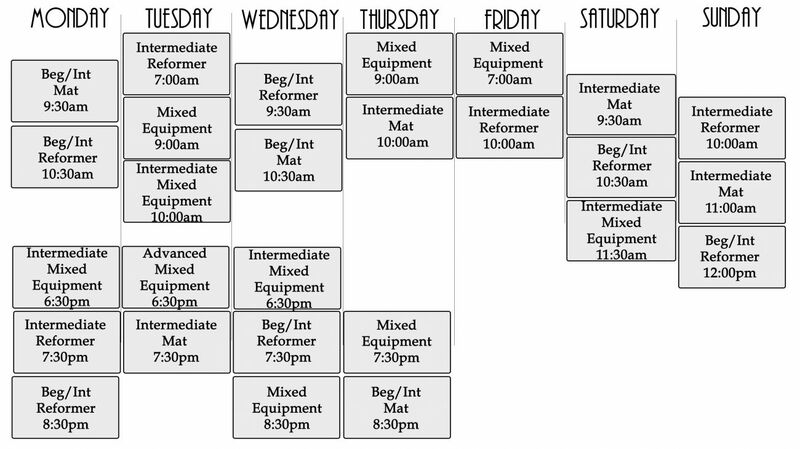 Duet, trio, and quad pilates sessions are also available. One instructor will design a workout to accommodate the needs of all participating clients. We recommend that you create these groups, but we can also help match you with people at a similar fitness level. This semi-private session will include a combination of reformer, mat, cadilliac and chair based on availibilty. Download the mobile App to schedule and pay on the go! “Creative, Engaging and Energizing. Those are the words I’d use to describe what it’s like to work with Jessy Babin. She is absolutely the most resourceful Pilates teacher I’ve met.